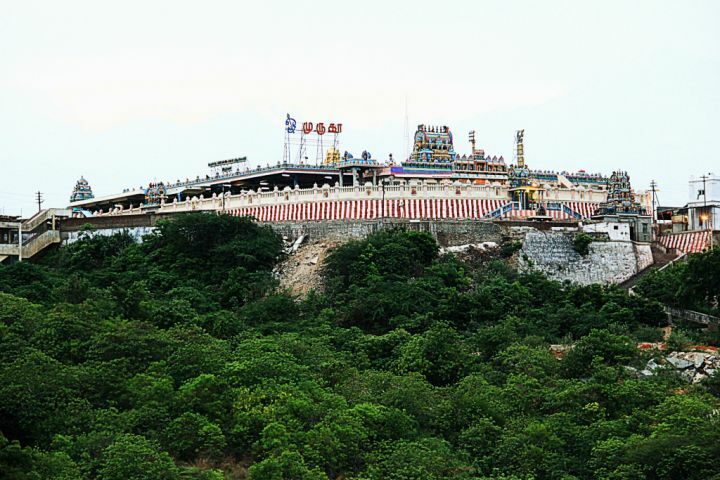 Located atop a hill covered with dense forests at a hill station (Solaimalai) about 1100 feet above sea level, Pazhamudircholai is the sixth abode of Lord Murugan. 1. Avvaiyar, Hot or Cold Fruit? Avvaiyar was a great devotee of Lord Murugan and she worshipped Lord Murugan as her dearest God. 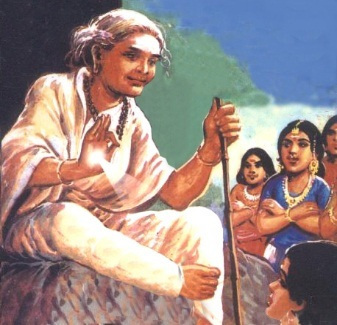 Once, she wanted to see the renowned Murugan temple called Pazhani which was located at the top of a big hill. She walked all the way there and nearing the temple, said to herself, "I am tired… Let me sit awhile below this tree and perhaps I will be able to continue my journey after resting." While sitting, she heard a boy, still a child, voice unbroken. "Hello, grandma! Look up, I'm up here!" Avvaiyar looked up and saw the child sitting on a branch. Avvaiyar smiled at the child and said, "Yes, I am". "Would you like some fruit? I can shake this tree and the fruit will fall on the ground and you can pick them up. Want some?" he responded. "But wait a minute. Do you want the fruit hot or cold?" asked the child smiling. Avvaiyar looked at him and laughed. She was hungry… and the child was making silly jokes. He doesn’t seem like other children, she thought, but brushed it off. "Hot or cold? I've never heard of such a thing," she replied. "Hot or cold? ", he asked firmly. He laughed and shook a branch gently, causing fruits to fall like little pebbles onto the ground. Avvaiyar picked up a fruit and blew at it to get the sand off. The child came down, stood beside Avvaiyar and said, "You blow at the fruit as a hungry man blows at a vadai just out of the oven…Is the fruit not cold as you desired, grandma?" The gesture of blowing the sand in the fruit appeared as if the fruit was hot. It also meant, that the fruit that fell to the ground is heated up by the earth's heat and if the fruit is caught before it falls to the ground is cold. READ: Lord Murugan, God of Tamil! Avvaiyar was stunned, she realized she had become complacent, she thought the boy to be an illiterate, but he has taught her a big lesson. She had a momentary pride and neglected her mind, thinking that the boy is illiterate and she was knowledgeable. This incident made her realise that nobody should be neglected. She then requests the boy to reveal his true image. 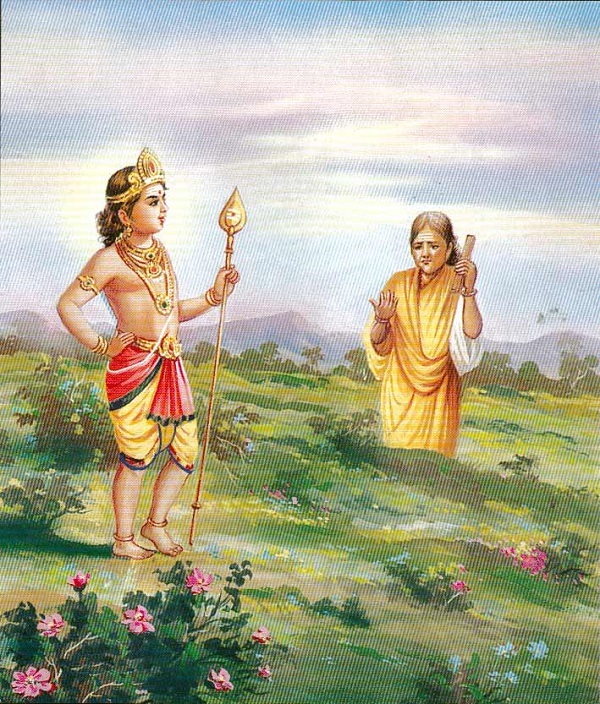 The boy revealed that he was Lord Murugan incarnate. Avvaiyar was happy and worshipped Him. In olden days only the Vel has been worshipped as the moolavar or main deity. Later, an idol of Murugan with his consorts Valli and Deivanai was added. In this superb temple, Lord Murugan is worshipped as Jnana Shakti and Goddess Valli is worshipped as Iccha Shakti and Goddess Deivanai as Kriya Shakti. This is the only one out of Six Abodes of Muruga (Aarupadaiveedu) where Lord Muruga is seen with his consorts Valli and Deivanai. Apart from visiting the temple to seek the divine blessings of the Lord, many people come to this temple to pray for children, marriage and even for education. The Naaval tree usually yields fruits only during the Tamil calendar months of Aadi and Aavani (July - September). But, strangely, the tree in these temples yields fruits in the Aipasi month (October - November), a month when Lord Murugan's iconic Sashti festival occurs. 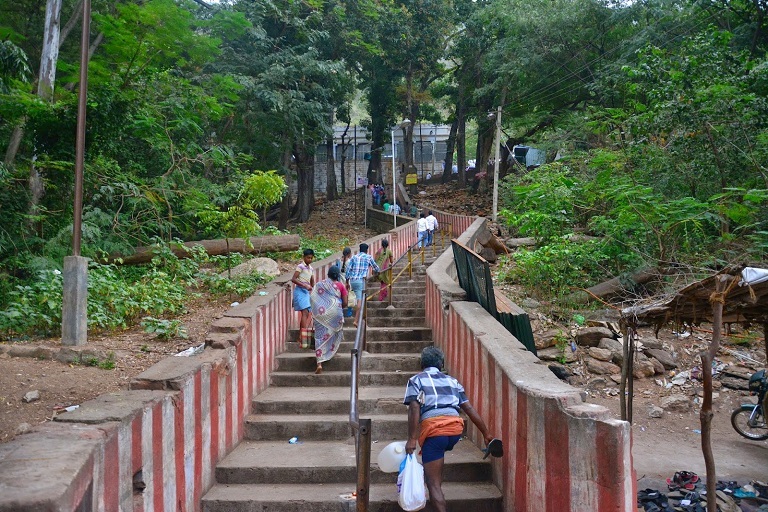 A natural spring called Noopura Ganga with a temple dedicated to Raakkayi Amman is located at the top of the hill. Pilgrims to the temple take a dip in this small, sacred spring which is said to have originated from the anklet of Lord Vishnu. It is believed that devotees who worship at this shrine are blessed with wealth and health. The Silambar river flows near the temple. 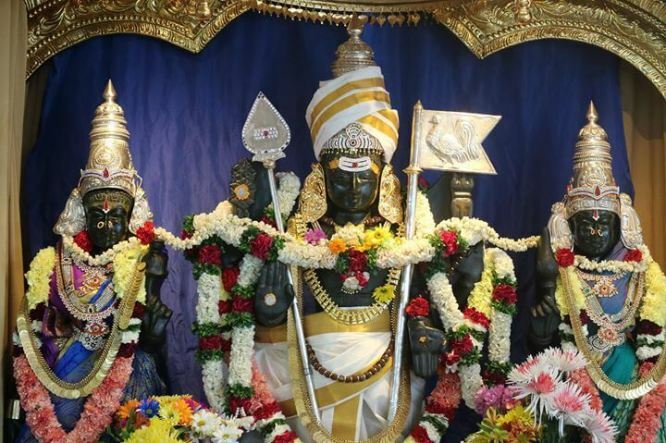 READ: What Do You Need to Know About Thirumurugatruppadai? The temple is also blessed with great flora and fauna indigenous to this area of the hill. Those who prefer to visit the temple by foot can take a trek uphill through the monkey-infested causeway across the green forests.